OMG Posters! 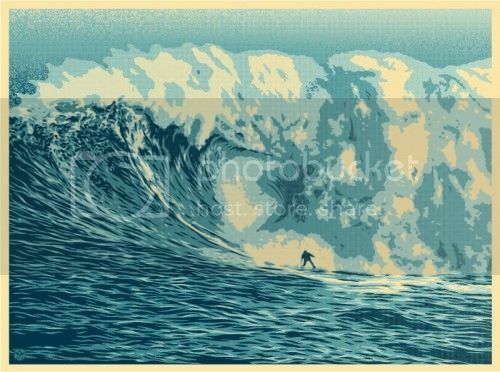 » Archive "Jaws Wave" Art Print by Shepard Fairey (Onsale Info) - OMG Posters! Today is a slow news day, so this is the only new post this morning, but at least it’s a pretty great one. Shepard Fairey’s newest art print, “Jaws Wave”, is set to drop next week. It’s an 18″ x 24″ screenprint, has an edition of 450, and will probably be $45. It will go up Tuesday, September 29th at a random time. Visit ObeyGiant.com. ONLY THE 9TH POST AND THIS POST ARE BY ME, BEEFLOAF. THE REST ARE BY AN IMPOSTOR. I AM SICK OF IMPOSTORS SO I HAVE DECIDED TO CHANGE MY NAME TO FAIREYLOAF TO CELEBRATE MY FAVORITE ARTIST! !